The Pit is pleased to announce a new gallery initiative called The Pit Presents. Starting in November 2018, The Pit Presents will host galleries from other cities in a series of residencies and swaps. The exhibitions will coincide with The Pit’s exhibition schedule and will debut with a swap with New York’s Step Sister opening on November 4, 2018 from 4-7pm. 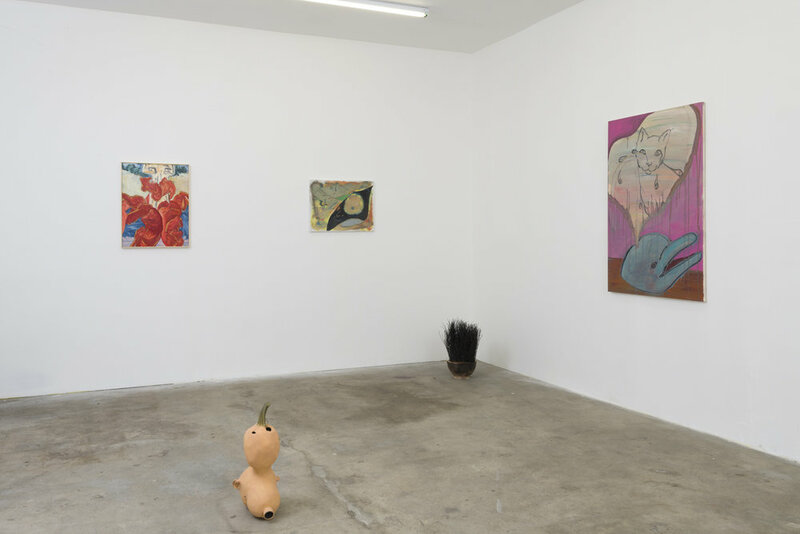 The Pit Presents / Step Sister features the work of five New York based artists working in painting and sculpture, navigating the space between figuration and abstraction. Hinge’s works are grim in their humor, brightly depicting gothic scenes populated by cats, ghoulish figures and art historical references. Maghazehe’s series of expressive clay portraits framed in cardboard boxes are self illuminated friezes. The sculptural repertoire of Sullivan's plastic forms examine the relationship of line, both literal and graphic to the surreal and cartoony. Irzyk’s foam core paintings and collaged pipes continually slip from one form into another, never becoming fully nameable while remaining recognizable. 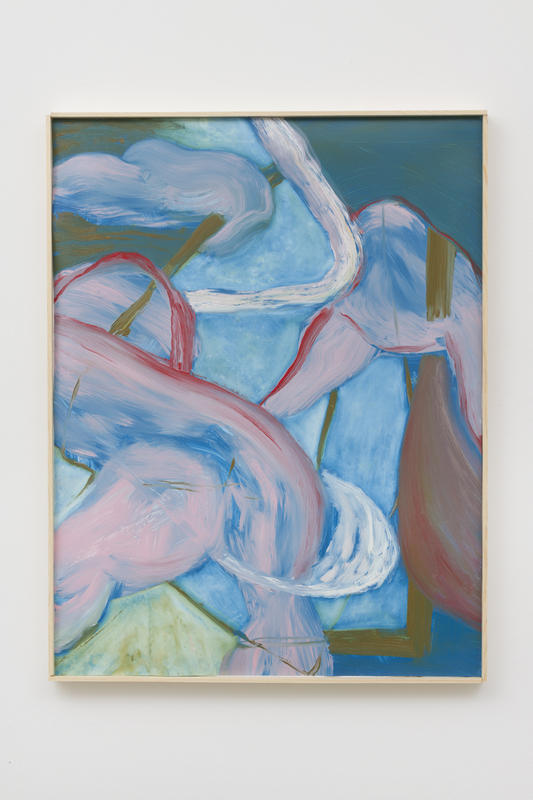 Roth’s all over abstractions of muscular vegetation are at once expansive and intimate, made by the accrual and removal of thin layers of oil paint. Philip Hinge (b. 1988, Seattle WA) received his MFA in Painting from Virginia Commonwealth University and his BFA from Maryland Institute College of Art. Hinge has shown his work at a variety of venues, including; Connersmith (Washington DC), Freddy (Baltimore, MD), Brennan & Griffin (NY, NY), The Breeder (Athens, Greece), and GCA (Brooklyn, NY). In February 2017 he launched a project space/gallery named, Catbox Contemporary, in Ridgewood, NY. Hinge lives and works in Ridgewood, NY. Pooneh Maghazehe is a Brooklyn based artist. She received her MFA from Columbia University (2011). Maghazehe teaches at the Maryland Institute College of Art and Design, and is the founder of LM // PM Productions LLC. Recent exhibitions include 17 Essex, Marinaro Gallery, New York, NY, Columbus Property Management, New York, NY, Institute of Contemporary Art Portland, and the Institute of Contemporary Art at University of Pennsylvania. Nicholas Sullivan lives and works in Brooklyn, NY. Sullivan earned his M.F.A. in Sculpture from Massachusetts College of Art and Design, Boston, MA, and his B.F.A. in Sculpture from the University of Massachusetts Amherst, Amherst, MA. Recent exhibitions include;Comfort Animal, A-L Gallery, Seoul SK; Neu, No Place Gallery, Columbus OH, O, Catbox Contemporary, Brooklyn NY; The World Without Us, Brennan & Griffin, New York NY; Gist & Gesture, Kavi Gupta, Chicago, IL; It/Ego, Brennan & Griffin, New York, NY (2016); Peanut, Mumbo’s Outfit, New York, NY; Foster Prize Exhibition (curated by Kijidome), Institute of Contemporary Art, Boston, MA. He is an assistant professor in Studio Foundations at Massachusetts College of Art and Design. Nick Irzyk lives and works in Brooklyn, NY. He received his MFA from Virginia Commonwealth University in 2014 and his BFA from Massachusetts College of Art in 2012. Recent solo and two person exhibitions include: Columbus Property Management, New York, NY, Chin Up Bar, Baltimore, MD, Neu with Nicholas Sullivan at No Place Gallery, Columbus, OH, Syracuse University, Syracuse, NY, Rough Country with Michelle Segre at 247365, New York, NY and 106 Green, Brooklyn, NY. Victoria Roth (b. 1986 Paris, France) currently lives and works in Brooklyn, NY. She received her BA from Brown University in 2008 and her MFA from Columbia University in 2014. 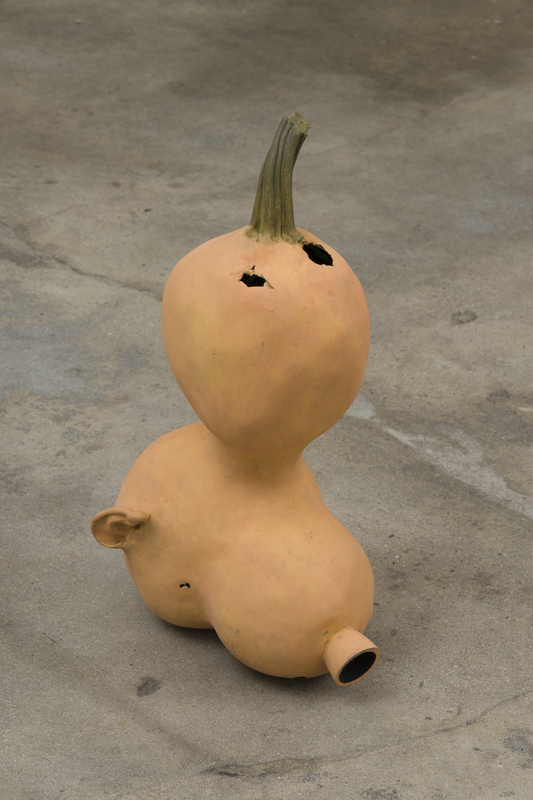 Recent solo exhibitions include fAN Kunstverein, Vienna and Brennan & Griffin, New York, NY. Recent group exhibitions include The Clear and the Obscure, Lulu, Mexico City, MX (2016), In the Mix, Hometown Gallery, Brooklyn, NY (2016), Vivid Bra, New York, NY (2016), SPRING/BREAK Art Show, New York, NY (2016). Roth was an artist in residence at the Sharpe-Walentas Studio Program Residency in Brooklyn, NY in 2015-2016.